A Christian Response To - Should You Believe in the Trinity? 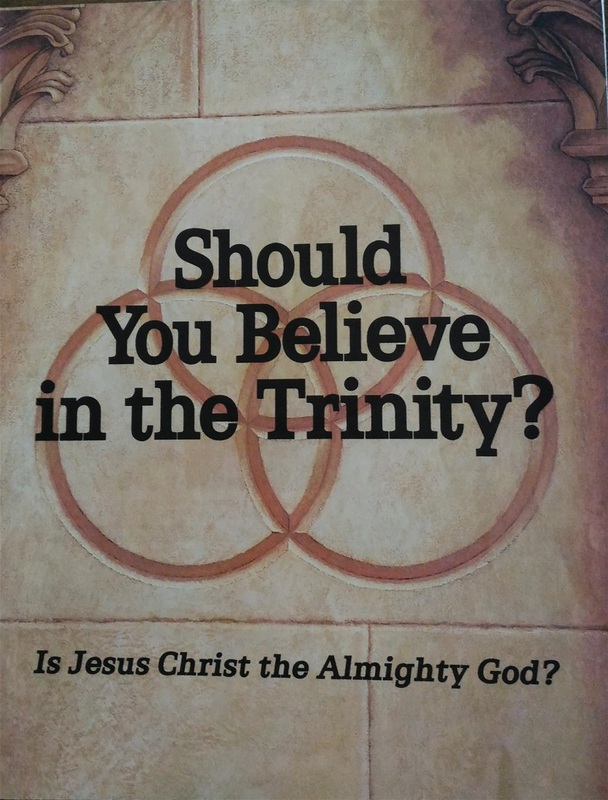 The Watchtower Bible and Tract Society's 31 page booklet, "Should You Believe in the Trinity? ", was a popular and effective tool for JWs to hand out when someone claimed to believe in the Trinity. Should you believe in the Trinity? They will say, No! The booklet's attacks on the Trinity doctrine starts early in its writings and continues all the way to the end. How do they attack the Trinity doctrine? If I were to take the quotes and reasonings as they are appear in "Should You Believe in the Trinity?" at face value, I would agree with the Watchtower Society and run away from the Trinity doctrine as fast as I can. But I suggest (PLEAD is a better word) that you do not be too hasty. It would be a good idea if you check the quotes they print in the booklet for accuracy first. Did the Watchtower Bible and Tract Society quote their sources accurately? Or, are there misquotes in this booklet; and if so, are they intentional? If they are found to be accurate, then it would be wise to reconsider whether or not to believe in the Trinity doctrine. However, if they misquoted their sources intentionally, then the Watchtower Bible and Tract Society is guilty of misleading their readers by deception into not believing the Trinity doctrine. A PROTESTANT publication states: "The word Trinity is not found in the Bible... It did not find a place formally in the theology of the church till the 4th century." "The word Trinity is not found in the Bible, and though used by Tertullian in the last decade of the 2nd century, it did not find a place formally in the theology of the church till the 4th century. It is, however, the distinctive and all-comprehensive doctrine of the Christian faith. It makes three affirmations: that there is but one God, that the Father, the Son and the Spirit is each God, and that the Father, the Son and the Spirit is each a distinct Person. In this form it has become the faith of the church since it received its full formulation at the hands of Tertullian, Athanasius and Augustine." Notice that the quote from the booklet left out a crucial point. Why? Because the Watchtower Society argues that the Trinity doctrine was developed in the 4th century, and was not believed by the early Church Fathers. If the doctrine of the Trinity was believed by them (the early Church Fathers) prior to the 4th century, then the Watchtower's claim of later developement is false. The last page in their booklet teaches, "Reject the Trinity - THERE can be no compromise with God’s truths. Hence, to worship God on his terms means to reject the Trinity doctrine". If the information in "Should You Believe in the Trinity?" was an accurate source of information, why is it no longer distributed or easily accessible? One would think that since there can be no compromise with God's truths, they would not have discontinued its distribution (unless they found something wrong with it). The Watchtower's President taught in their October, 2018 JW Broadcast, "You see, we are under obligation to. . . . expose false teachings that misrepresent Jehovah; and a classic example of an unscriptural dogma that God’s people have exposed, is the Trinity." Seems what had been exposed, is not only their misquotes and lies, but also how they define the Trinity (see Three Gods? for more information).